Columbia College-Fort Leonard Wood staff, faculty, students and family members visit with veterans at the Saint James Veteran's Home in St. James, Mo., after donating blankets. The Columbia College-Fort Leonard Wood Student Organization kept busy during this past holiday season with contributions to not-for-profit agencies in the local community and Joplin, Mo. The Student Organization is continuing to support its adopted 2nd grade classroom at Cecil Floyd Elementary in Joplin, Mo. The group was able to provide holiday cheer by donating books, board games and reading materials that were well received by the students and teachers. The last endeavor the Student Organization gladly participated in was the Saint James Veteran’s Home Blanket Campaign. Columbia College-Fort Leonard Wood students and faculty were encouraged to donate blankets in support of the Saint James Veterans’ home, located in Saint James, Mo. The goal was to have every veteran receive a blanket to show appreciation for the sacrifice and service they have given to their country. From the generosity of the campus community, every resident was able to receive a blanket on Christmas Eve. 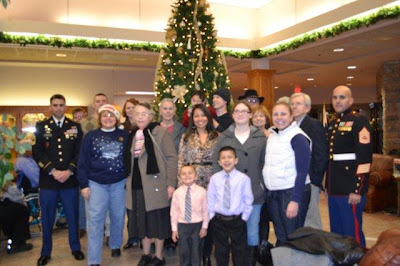 Campus staff, faculty, students and members of their family joined together to give the blankets to the veterans and spend time with some of America’s worthiest heroes. Amos Long, a student at Columbia College-Fort Leonard Wood, and his wife kindly sang Christmas carols during the visit.